With your new dashboard, you can easily "Get Things Done" by using the list to complete outstanding items. One of those "things," is the ability to quickly identify how many venues are missing a region. 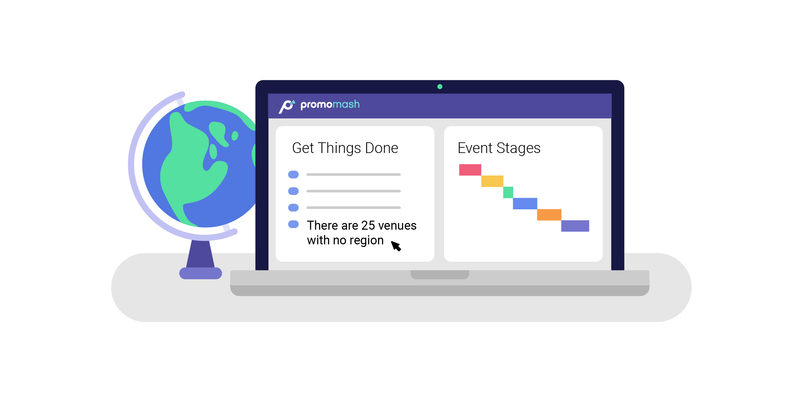 If you plan to filter by regions at any point - whether looking at completed report copies, pulling analytics, or approving reports, it's very important to have all venues assigned to those regions. (If you aren't using regions, then this doesn't apply to you.) You might be asking yourself, what do I do if I have venues without regions assigned? As soon as you filter by Regions that are "Not specified", the system will only show venues that are missing a region. With the remaining list, you now have the ability to select which stores you would like to be assigned to similar Regions by checking the box(es) located on the left hand side. As you click each checkbox, a new menu called "Batch Update" will appear on the right-hand side of your screen. The venue regions will automatically update when you hit submit, and those venues will no longer show under the filtered view. (Remember, we are only seeing the venues where the region is "Not Specified"
You can filter by state first to easily apply a region to the filtered venues. For example, if you have WA, OR, & ID as the Northwest then you can filter by those 3 states and then use the Batch Update to apply the Northwest Region to all venues in those states.